These Bentworth mini-conventions are becoming a very nice habit to develop. As soon as you walk through the door you are greeted by friendly, familiar faces and feel 'at home'. By the time the music began most of us had been there for a couple of hours and the chance to talk to an meet old…and new…friends, caught up on the latest gossip, discussed the weather and gigs we'd been to etc. 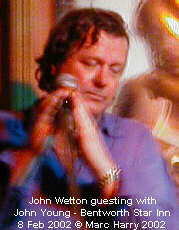 It was especially great, on this occasion, to be able to stand and chat with John Wetton as well. I still find it a little strange to be chatting face to face with someone whose music I have listened to and loved for more than 20 years and who seemed so distant and untouchable on that Wembley stage back in 1982! We were treated to the new versions of Significance and Used next. The former was notable for the wonderful, deep, rich cello at the end which, I swear, made my table vibrate sympathetically! 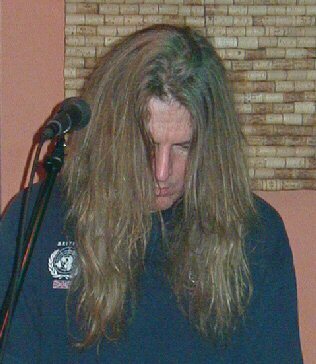 The layered vocals John is able to produce in his new studio add a whole new dimension to the sound - and far from an unwelcome one. Again, the string sounds are prominent on the latter track, the first time I'd heard it, I think - and certainly one destined to become a favourite - a lush ballad without a hint of treacle. Underside, although still a relatively new song, has already become a familiar one. I particularly like the bare fifths in the accompaniment and the more prominent ostinati (almost Oriental, dare I say - probably because they are in fifths as well) There is even an ethnic feel to the solo in this - absolutely apt considering the nature and subject of the song. As it has developed this song has evolved into a sort of 'world tapestry' - a work of art which draws you in to look closer and closer until the starkness, truth and challenge of the lyrics throws into stark relief our own lifestyles with the less fortunate. Both the solo in WIWY and the 'Beethoven' keyboard solo at the start of part 2 gave us another glimpse of one of the things I like best about John's work. His choice of voices for these solos is absolutely right; comfortable and penetrating enough without sounding too cutting or 'toppy'. Since the keyboard world largely abandoned analogue synths this has become a very difficult area for most players to come to terms with. Rick Wakeman, another of my heroes, has rarely seemed to find the right answers in his solo work of the last 20 years (interestingly, he has now finally reverted to using his old Moog as a solo instrument). That solo Moog sound and those of the old Yamaha CS5 etc. both cut through the mix and had enough class to stand on their own and John, by his choices here and use of portamento etc. also does just this. Childhood's End is a personal favourite for an old progger like me - I can't wait for John's long-promised prog album to eventually see the light of day. Through John Young's 'advertising' I finally gave early era (i.e. Gabriel-era) Genesis the chance it had waited in my collection for for 20-odd years - and it is easy to spot the influences in this epic song. I'd love to hear a full band version of this piece one day! Next we heard 2 new songs - Open Skies (not actually a new song, more resurrected from eighteen months on the shelf with a quick polish, Doug) and Everything I Own. 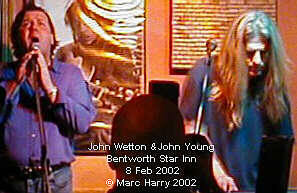 Open Skies is another ostinato based song, the lyrics of which give us a glimpse into John Young's personal theology I hate the term 'New Age' but John has produced at least 2 albums which could or would be so categorised (PA and SB) and the music of this track owes something to this same genre. The second of these tracks sounds a little familiar - I often use this as a benchmark for a new song with 'hit' potential. I like this one a lot - particularly with more of those big, 'farty' analogue synth sounds underpinning the whole thing. John, get your publisher onto hawking this one around…I could imagine a Phil Collins or a Paul Young singing this one. 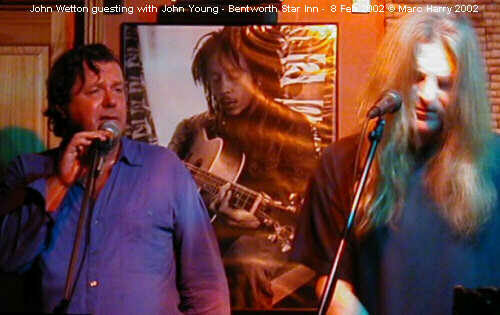 At this point in the show JY was joined by the Bentworth Virgin (a.k.a. John Wetton). A nice, acoustic Battle Lines was followed by After All and Last One Home (in which JY sang the verses and JW the lead in the choruses.) At Wembley in 1982 I was about 100 rows away from the stage and John, fronting Asia, was a tiny figure in the distance. Although the music was huge it was not possible to feel close to the performers - yet here was the same man just about 10 feet away from us. As he sang these first 2 songs (both songs are deeply personal to Mr. Wetton) the emotion in his face matched that in his voice and the intimacy of this performance made it very special. I often wonder, having seen and felt the impact of Last One Home - both here and with Qango, whether JW now prefers this or Arkangel. Presumably, having made the latter the title track of an album Arkangel was the original choice - and I have to concur. 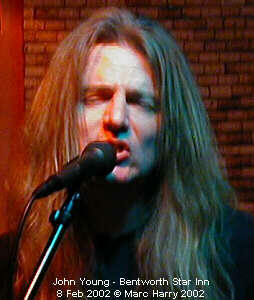 Being well acquainted with, and a lover of Arkangel before I even knew Last One Home existed it had my original vote…yet LOH makes such a fine signature tune for JY and is such a great sing-along audience participation number it now warms and thrills me in a way Arkangel doesn't. I think I'll settle for having both! 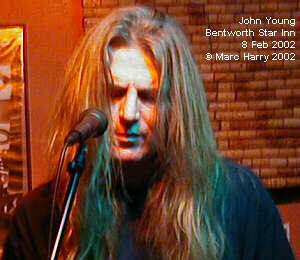 John Young finished the show with Insignificance and the omnipresent Keyboard Mayhem just to send us home happy. The contrast of Significance with Insignificance is pleasingly appropriate (and a very clever way to put an album together) although I need more time with the latter to learn to appreciate it fully. The afore-mentioned progger in me means, of course, that I enjoy KM. In it JY is able to showcase many of the multi-various skills in his personal filing cabinet as it visits lyrical, balladic passages, classical excerpts and big, Lisztonian romanticism in turn in a jig-saw of virtuosity. So, to sum it up we had good food and drink, good friends and good music all in one night. What more can anyone want? Thanks! .